All Termite (White Ant) Control:- Flexible Tailored Solutions for the control and prevention of Termite infestation. As the Previous owner of a highly successful Local Pest Control business for 13 years Geoff decided to concentrate on his skill in the field of Termites. Since October 2007 he has been able to focus on the Detection and Prevention of Termite infestation also giving peace of mind when purchasing your greatest asset -Your new home. Geoff will provide a comprehensive prepurchase inspection of any property for ALL Timber pests – Borers’ Dry Rot and Termites. 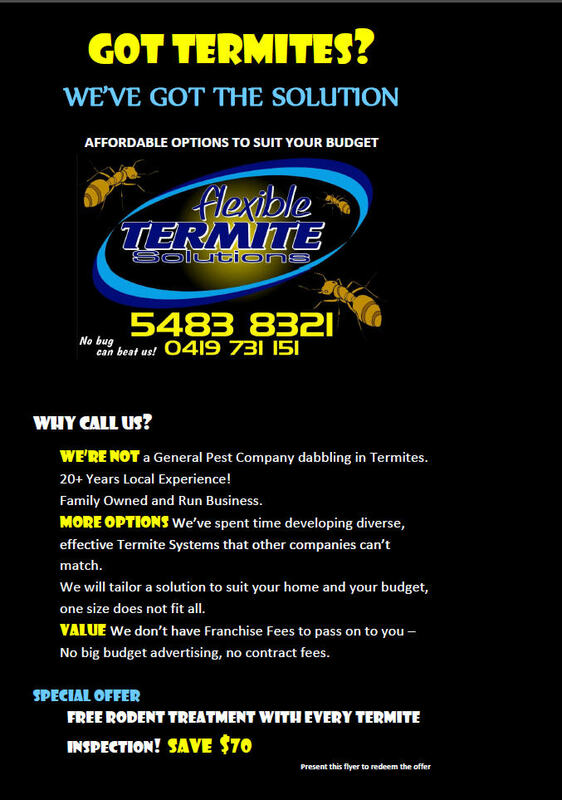 Geoff has 15 years local experience and will provide you with a Flexible cost effective Solution for any Termite Problem or prevention. You will get what you expect – Honest Fair Prices – Geoff is reliable’ with high moral standards and well known by hundreds of local people. He stands 100% by his work. You will never pay too much – we live in this Town. We use the latest Technology in the detection process with Microwave movement sensor (Termatrac)’ moisture sensors’ Boroscope’ etc. We communicate in every process and never pressure sell; you save money as we are NOT A FRANCHISE so have none of the associated costs to pass on to you.